I'll don my aviation geek hat on this morn. The red lines on the North side all have a sharp turn, shortly before or after reaching the runway. That's because of a Presidential order dating back to February of 1935. On this day in 1935, President Franklin D. Roosevelt banned all airplanes from flying over the White House. His reasoning? The planes weren’t allowing him to sleep! The ban is still in effect today, serving a greater purpose: security. The ban never totally went away, and of course after You Know When, the no-fly zone was actually extended. You now can't fly a private aircraft within 40 miles of the VOR/DME at National without a transponder, flight plan, and ATC flight following. Within that zone is an even more restrictive 15-mile circle where you're likely to be intercepted by fighter jets if you're in there without permission. 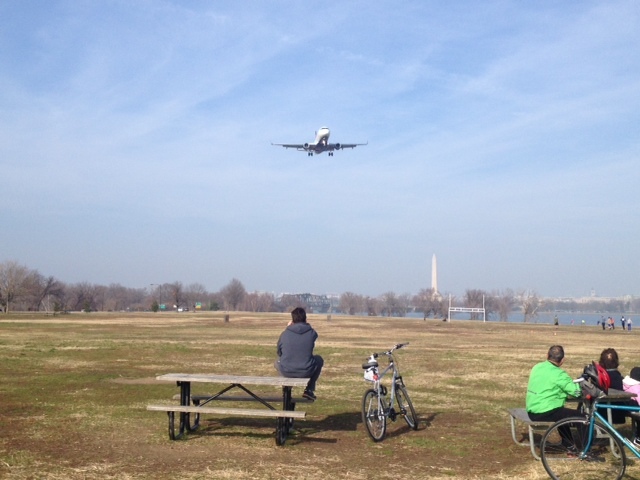 While all this means that flying in and out of the city is a restrictive hassle, and a difficult approach in any kind of weather, it has had the effect of turning Gravelly Point into one of the premier plane-spotting locations in the world. It's the old Post estate on the island; before Mr. Trump bought it, it was still owned by the Post family (of Post Cereal fame) and was their winter retreat. This estate actually pre-dates the nearby Palm Beach International airport, which began operations as Morrison Air Field, and was an Army Air Force base during WWII. After the war, air travel to Florida began its long expansion, and today virtually every flight headed in or out of PBI flies directly over the old Post Estate on the way through. The Mediterranean-style Mar-a-Lago, completed in 1927 for cereal heiress Marjorie Merriweather Post, is a National Historic Landmark. Trump bought it in 1985 and after extensive restoration, opened it 10 years later as a private club. About 450 of the island's elite are members. But now this becomes easy. 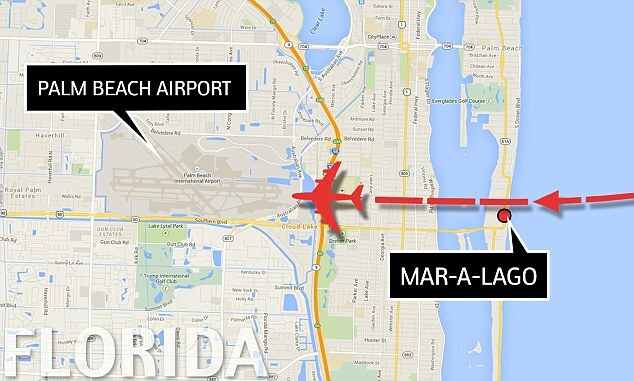 All Mr. Trump needs to do is invoke "security", and there won't be planes flying over his private airspace whenever he's in town. According to my snowbird aunt, they've already changed the flight patterns PBI, although I could find no evidence of such in my research this morning. Remember our blog title today; Rank Has Its Privileges. When the Kennedy Compound existed on the island, this was never an issue - but their place was up on the north end, near the Riviera Inlet and miles away from any commercial aircraft ferrying tourists. I suppose it would be just like the egomaniac that Trump is. "They won't stop flying over my house? I'll show them!!!" But it does seem like a stretch. In any case - you can expect a follow-up to this story in April of next year, as I personally travel from Boston to Palm Beach International. I fully expect to approach the airport from the west side, as the prevailing wind comes from the east, but you never know.